Last week I wrote blog post about the 1916 Brandon Train Disaster which killed at least 18 people right in the heart of the city. The victims were temporary workers, poor Ukrainians, many with families, who took the dangerous work of clearing snow from the tracks on a -46 degree day. According to my research to-date it was the worst Manitoba train crash in terms of loss of life until Dugald in 1947. It is also likely the deadliest single event in Brandon's history. There is, of course, no memorial to this tragedy. The only trace is the handful of remaining headstones in Brandon cemetery. With its centenary coming up in just a couple of years I want to get the ball rolling on having this event properly commemorated. I've contacted Mayor Decter Hirst and the city's heritage coordinator about the need to do something, be it as little as a small sing (similar to what they do for heritage homes) off of Pacific Avenue and at the row of graves, or perhaps even similar to what Dugald has done to commemorate their train disaster. If this is something important to you, please contact Mayor Decter Hirst and Councillor Corey Roberts to show your support. Thanks for your research and lobbying to get this recognized in Brandon. I write a column in the Brandon Sun and have mentioned the 1916 train crash several times. 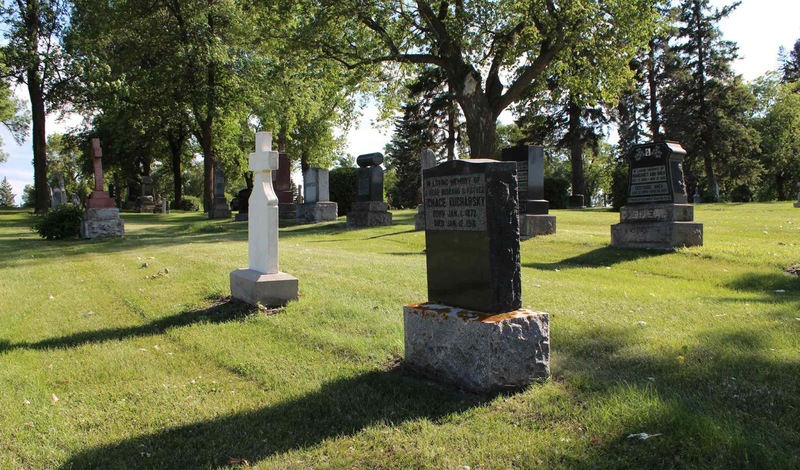 In my June column “Get to Know The Brandon Cemetery,” I made much the same observation that you have: that while the 1947 Dugald train disaster is recognized with a plaque at the Brookside Cemetery, there is nothing in Brandon. Keep up the good work and all the best! I don't have a subscription to the BSun so I wasn't able to peek behind the wall and see what people had written about it recently. That's great ! Also, Dugald has a nice storyboard with a memorial and a couple of benches. http://www.flickr.com/photos/christiansphotos/4518986228/ That would be nice to have, say, in Errol Black Park which would be close to the site of the crash. Again, thanks for your research and suggestions for Brandon! I also would like to see the Brandon Sun available free to everyone. But I post my columns online after publication in the Sun. My Sun columns about Manitoba history are collected here: http://www.livewelldogood.com/manitoba-history.php. The BSun thing is a tough one. I can see why they want to be behind a pay wall as they're the only game in town. Yet, if Brandon news, important issues have no presence on "the interwebs" then they pretty much don't exist to the outside world.